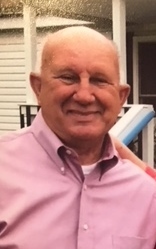 James Daniel “Pete” Chestnutt, age 68 of Wagram went to be with the Lord on Sunday, October 14, 2018. Funeral services will be at 2:00 p.m. on Wednesday, October 24, 2018 at the Wagram Church of God officiated by Rev. Rick Brewer. Burial will follow in Laurinburg Memorial Park. James was born in Duplin County, North Carolina March 12, 1950, son of the late Jack Chestnutt and Macy Blizzard Chestnutt. The Lord blessed him with many gifts one being a Sunday School Teacher at the Wagram Church of God. In his life, he enjoyed fishing and working with his hands to help anyone who was in need. James was a loving and dedicated husband, father, grandfather, brother and friend who will truly be missed. Along with his parents, he was preceded in death by his brothers, William Chestnutt, Keith Chestnutt and sister, Patsy Anderson; his children, Fred Huckabee, Lynn Bud and grandson, James Alex Bullard III. James leaves behind his wife of 27 years, Patricia Ann Chestnutt of the home; son, Carroll Lee Pusey (Tammy) of Lexington and daughters, Barbara Bullard (Alex) of Raleigh, Charlene Marshall of Lynchburg, VA; sisters, Annette Gurley of Warsaw, Geraldine Henderson and Francis Gurley both of Wallace; five grandchildren, six great grandchildren and a host of nieces, nephews and many friends who loved him dearly. The family will receive friends from 12:30 p.m. until 2:00 p.m. prior to the service on Wednesday at the Wagram Church of God, 21741 McKay Street, Wagram, NC.